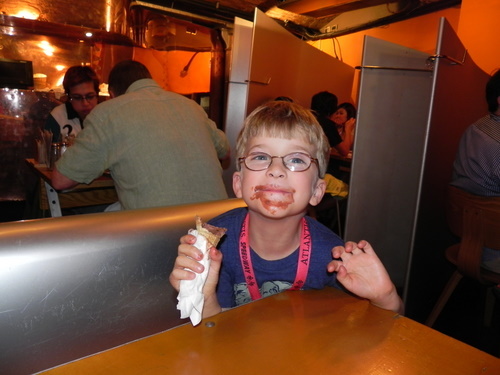 Eating in London can be a challenge, especially with kids. Not that there aren’t many options. But in the more touristy areas around Covent Garden many of these choices can be pricey and of dubious quality. That’s why I like Belgo Centraal. 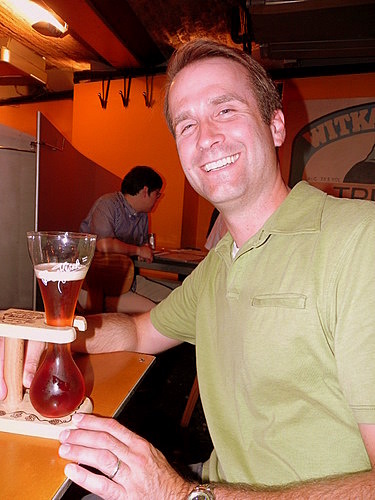 When I first dined at Belgo, it was the late 1990s and I was a poor graduate student trying to feel hip and cosmopolitan without spending a lot of cash. The then-new restaurant fit the bill, with its post-industrial interior (you take what feels like a cargo elevator from the main floor down into the basement to dine) and mystifying bathroom sinks. All of this atmosphere is still there, but with a more well-worn feel to the place and less of a hipper-than-thou vibe. Perhaps this is helped by the fact that the servers are wearing cassocks. The better to look like Belgian monks (and brewers) I suppose. Kids eat well. I like it that the kids’ menu includes mussels and rotisserie chicken instead of the standard fare of nuggets and burgers. They are open all afternoon. You can get something to eat at any point from 12 p.m. on. So if your kids need dinner at 4, you’re all set. The location can’t be beat. It’s an easy walk from any number of things you’re likely to be doing in the center part of the city from Covent Garden to the British Museum (don’t let a Londoner tell you that you must take the Tube – we walked from the museum in about fifteen minutes). It’s also in a great spot for pre-theater dining if you’re going to a show. One caveat: Earlham Street where the restaurant is located is in a rabbit’s warren of small lanes and the front of the restaurant itself is plain (you don’t actually see into the dining area because it is subterranean). I’ve been there many times and still walk past it by accident sometimes. You can get directions to the restaurant on the website. The three essentials of Belgian dining are well represented. These would be moules (mussels), frites, and of course beer. Now, these aren’t the very best mussels you’ll ever have. But for the price, they are really quite good. And they come with a variety of sauces from Green Thai (my personal favorite) to Moules Blanches – cooked with white beer, bacon, and shallots. And I love it that I can indulge in that girliest of pleasures – fruity beer. Lindemans Pecheresse, the Fuzzy Navel of beers, is my drink of choice. There are other Belgo locations around London as well, all of them offering the same menus and specials. 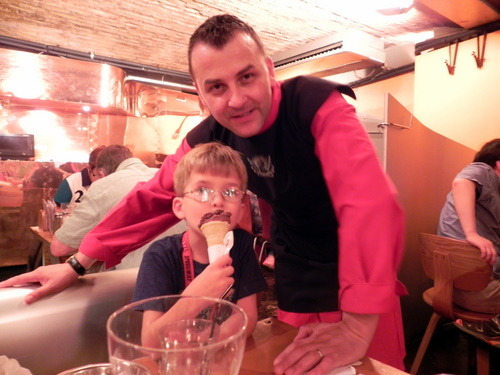 I recommend any of them for a eating in London with kids. And while you’re there, have a beer for me, OK? And a waffle too. Thanks! I share this as part of Wanderfood Wednesday at Wanderlust and Lipstick. If you like reading posts about food, that’s the place to be. How can you not love a restaurant that will take a child into the kitchen to show them where the food comes from?!? I wish we had known about this when we were there. After our long day in the British Museum we had dinner at a less than stellar (in all regards-food, service, cleanliness) place because we were hungry and didn’t know of anywhere else to go.